Korgalzhyn - Photo provided by Stanislaw Warwass. "Saryarka - Steppe and Lakes of Northern Kazakhstan" is an important site for migratory water birds on the Central Asian flyway because of its wetlands. 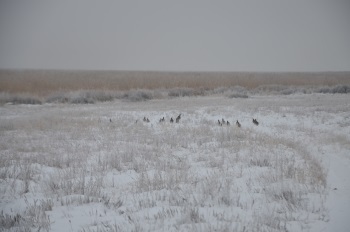 It also is the habitat of the Saiga antelope and the Siberian white crane. Both are critically endangered. The land consists of 120,000 ha of "virgin" steppe. I visited this WHS in June 2017. From Astana, we drove for around 2 hours (130km) to the "Bird Paradise" Visitor Centre in Korgalzhyn. The impressive flat steppe view will kick in after you exit Astana and will continue till you get to Korgalzhyn. Countless horses and cattle, a few old Soviet Union ghost buildings, and a vast never-ending flat steppe. Road conditions are not too bad but careless overtaking and non-existing markings on the asphalt are the cause of frequent car accidents. Once in Korgalzhyn, we visited the Visit Center "Birds Paradise" with its old dioramaas and watched the 20 minute information video named "Mystery of protected lands". Hanging on the wall among different birding certificates, I spotted the original UNESCO Biosphere inscription certificate but not the UNESCO WHS inscription certificate. Korgalzhyn Nature Reserve is the largest protected area in Kazakhstan and is at the crossroads of migration routes for migratory birds, making it one of the key ornithological areas of international importance with 346 bird species, 700 butterfly species, 14 fish species, 374 species of flora, 2 species of frogs, 4 species of snakes and 43 species of fauna. Outside of the designated area, I could already spot pygmy owls, swans, marsh harriers, pelicans, herons, warblers and several waders apart from several marmots. Instead of losing precious time to take lunch, I brought some packed lunch with me and spent more time by the designated lakes. We drove more than 60km offroad on grassland and shrubland to see flocks of pink flamingos, cranes, lapwings, plovers and Dalmatian pelicans and increase our chances of spotting some fauna. We were quite lucky as we spotted a red fox and a white Arctic fox feasting on a Northern Lapwing. We were told that saigas are easier to spot in winter as they get closer to the 'ecoroute' and frozen lakes. However, saigas are mostly present close to the other inscribed reserve of Naurzum. Before entering the inscribed area proper, there is a painted UNESCO inscription sign and information board. The 'cafeteria' was open when we visited and it practically had only water, soft drinks, coffee and tea for sale! The bird hides are not located in the best places and the whole 'infrastructure' is old, broken or falling down to pieces. All in all, I'm glad I visited this WHS as a long worthwhile day trip away from urban Astana before heading to Turkestan. The agency in Kazakhstan which prearranged our trip to Korgalzhyn was concerned about whether we would be able/allowed to get inside. It appears that both the road from Astana to Korgalzhyn and the dirt road from Korgalzhyn into the park can get flooded/impassable in spring and our planned date of May 4 was still in the “problem” period. Phone calls to the reserve had received a “well we will see on the day” response. In the end, the period immediately before hand had been dry and we had no problems. As you make the 2hr drive from Astana to Korgalzhyn there are some interesting aspects of Kazakhstan’s “Russian” past and present to look out for. Around 40kms out you drive past the site of the ALZHIR women’s gulag where the wives, sisters, mothers etc of class enemies had been deported for “Betrayal of the Motherland” – guilt by association. The road then enters an area of flood plains of the River Nura on its way to the endorheic basin of Korgalzhyn – on our day of travel the river was a huge lake lapping the road and showing that it could easily block it. This was followed by an area of rolling, but no longer “virgin”, steppe which had been ploughed up during Khrushchev’s “Virgin Lands” campaign – indeed Astana (then called “Akmolinsk”) had been renamed “Tselinograd” = “Virgin Lands City” in 1962. However, the closer you get to Korgalzhyn the more you can see that this once ploughed land, which proved unsuitable for producing the vast and regular harvests of grain which had been hoped for, is now reverting to a more natural state with only the occasional crumbling “Kolkhoz” building and abandoned pieces of agricultural machinery to show what was once there. It appears that the reserve itself escaped all such activity apart from being designated as a “hunting reserve” between 1957-68. Our vehicle was a little microcosm of present day Kazakhstan – our young and westernised Kazakh guide with superb English but whose parents still looked back wistfully on the USSR, having lost their free apartments and future pensions, our middle aged driver who only spoke Russian and a young ornithologist of Russian ethnicity who struggled to understand Kazakh and English and whose grandparents had come willingly both for bonuses and with hope from as far away as Vladivostok and Murmansk to help create the “Virgin Lands” future. By 1959 Kazakhstan was the only SSR whose ethnic “owners” were in a minority. It is now 65/21 Kazakh/Russian and in April 2017 Nazarbayev announced the intention to move Kazakhstan entirely to the Latin alphabet by 2025. You then reach the very “Russian” village of Korglzhyn, past fading Soviet propagandist town signs of giant ears of golden wheat! There we visited the museum which also seemed to be from a Soviet time warp even though we were told that it only dated back to 2005. The nomination file shows, however, that it was closed that year for refurbishment and visitor numbers from previous years were also shown, so surely it must have existed before hand – it certainly felt so. The 2008 nomination file promises that “the museum will be rebuilt and transformed to a modern visitor centre with a café and souvenir shop”. Another unfulfilled dream I fear. The current museum is just about worth visiting for its period atmosphere if not for its wildlife information. Exterior tiles are dropping off whilst one interior wall is decorated with a socialist realist mural. The exhibits consist of a number of dioramas – the nomination file indicates that relatively few visitors actually go on into the Reserve so this is possibly all the “wildlife” they will see! On another wall there is an old B+W photo of a couple of visitors standing in front of shelves containing large numbers of stuffed birds. We were told that IUCN had asked that such exhibits be removed! The main hall contains a large relief map of the reserve showing the river/lake system – an interesting aspect of this is that it showed, with clear red and blue lines, a very large extension of both the core and buffer zones of the reserve to the west and south of main Lake Tengiz. This had been promised in the 2007 Nomination File and IUCN had commented positively that the State Party should “expedite planned extensions of the property including the additional area of Korgalzhyn State Nature Reserve”. We saw the same boundaries on signs in the park itself but there is no evidence that Kazakhstan has made any attempt to extend the boundaries of the UNESCO site itself. Instead the priority appears to have been on gaining “Man and Bisophere” status for the entire Reserve including this larger area. The WHS Nomination file states “Planning is also under way to enlarge the buffer around Korgalzhyn Nature Reserve by 211,700 ha, as a basis for establishing a UNESCO Biosphere Reserve. In addition, there is interest in gaining protected area status for a further one million hectares of what the Kazakhs term “hunger steppe” - semi-desert steppe to the southwest of Lake Tengiz (around Lakes Kipshak and Kirey) in Karagandinski oblast, an area which historically has been a significant saiga habitat.” We were told that to reach this large added steppe area to the West of Lake Tengiz required a day each way with 4x4 and a day spent there to make it “worthwhile”. Regarding the relative importance of “Man & Biosphere” and “World Heritage” it was of interest to note that the museum had on show a copy of a UNESCO certificate dated July 2012 signed by Bukova for the former but not one for its earlier World Heritage Inscription! We spent around 45 minutes at the museum and picked up our required local “Reserve” guide there – a pleasant lady who did absolutely nothing except get out of the car on our return drive to lift the barrier! To get into the reserve you have to go back north again out of Korgalzhyn, cross the Nura river and turn left onto a dirt road. Along the way you will cross the actual park boundary just before Isei Lake at 50.526060, 69.696152 and pay the entry fee (The Museum also charges entry but only collects for itself). Before entering we drove south alongside Isei for a while to get good views of Pelicans. After around 50kms and a couple of hours (including numerous stops to view wildlife) from Korgalzyn you will arrive at a motley collection of huts at 50.476525, 69.542927 . The Nomination File describes these as “a small guesthouse for 12 persons on the ranger station Karazhar in the reserve. A cafe and shop are opened when tourists are there.” Maybe, but on this day, apart from a friendly dog and a fisherman, we were alone – there wasn’t even anyone to give us the key to the nearby bird hide! We had our own picnic with us but I noticed that the “standard” tour has lunch in Korgalzhyn after the museum visit - which seems a waste of time given the effort of reaching the Reserve! Karazhar is situated on Lake Sultankeldi and you will have passed Lakes Sholak and Isei to reach it. In fact we saw as good flora and fauna outside the boundary as beyond it. I had never expected to see Saiga – and didn’t!! The Pelicans and Flamingos were present but there are far better places in the World to see them. The Demoiselle Cranes and Hen Harriers put on a good show as did the Marmots (which we had to go searching for using our drivers prior knowledge – the Reserve's guide was useless). But it was really the virgin “Steppe” landscape which was the highlight - carpeted with Tulips but different and much smaller species than those we were to see later in Aksu-Zhabagly. Oh - and beware the insect life of the Steppe and bring some repellent! It is not a good idea to visit Northern Kazakhstan during winter. 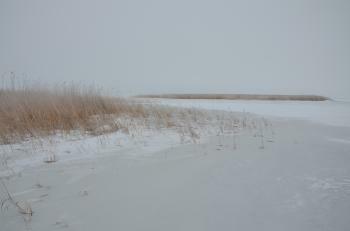 And especially windy Korgalzhyn with temperatures dropping to -20 degrees when I was there at the beginning of December. But I did, and this state reserve is ticked on my list. It is possible to visit Kargolzhyn National Park as a day trip from Astana, but you have to arrange everything in advance because there’s no one at Visitors’ Center (they call it museum in the village) who can take to the reserve without prior arrangements. The first bus from Astana Saparzhay Bus Station, very close to the train station, departs at 10am, and at 9am all tickets were sold out. I wanted to take a marshrutka, but the driver wanted to charge more than other pax in his car, so I waited the next bus (500KZT) at 1130 am. And I was a very good idea, because in the bus I met a young speaking English man (Artiom Yanushevski) who helped me a lot. Korgalzhyn used to be a small town but after the collapse of USSR most people with German, Polish, Russian and Ukrainian origins left the country. Only the half of the village is Kazakh and everybody speaks Russian. Lots of ruined houses, and at this time of the year everything covered with snow, lots of snow. After visiting Aksu Zhabagly on an organized tour with a German-Kazakh tour company (that cost me a lot, but it was worth), I decided to visit Korgalzhyn on my own. Well, after arriving to the village Artiom took me to Timur’s house where I spent a night. (There are only two official homestays there in Korgalzhyn.) His wife cooked a lot of tradition food just for me to try; some of it was really delicious. They do not speak English, but some German and Russian of course. They even have a wi-fi! Timur is one of the important workers for the reserve and a photographer amateur, so the whole evening he was showing me his pictures, movies and telling very interesting things about life in the reserve. And he was complaining about the lack of money or any support from the government either UNESCO. 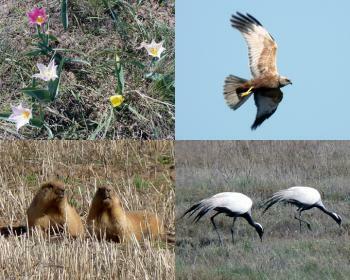 He also gave me some of his pictures – so I know how the reserve looks during spring and summer. Artiom’s father is working as a ranger in the reserve (like most men in the village) and the next day he took me for a 5 hour tour around the reserve. What to see? Well, not much, frozen lakes, some birds, some water animals winter huts and a lot of snow. We visited the viewing platform, the pioneers’ camp, houses where rangers stay while on duty, and at the end we went to see the Tengiz lake where, yes, it is possible even during the harsh winter, I saw some saiga antelopes and volves. At the end we came to Visitor’s center (no English speaking) where I saw some dioramas and heard sounds of the steppe. On the second floor there’s a board with the info that Korgalzhyn Nature Reserve is a UNESCO WHS. As my Russing is so-so, I think I missed half of the info provided. And I believe that late spring is the best time to visit this place. If you need email addresses, phone numbers to Artiom (only two more people are speaking English in the village, both teachers) and Timur or info about the costs, just let Els know and I will send them to her. Bird Migrations: Important stop-over points for migrating birds from Africa, Europe, and South Asia. Ask Gudmundsen Clyde Erik Jelinek Hamid Iain Jackson Ivan Rucek Jarek Pokrzywnicki Jonas Kremer Judith Tanner Martina Ruckova Mikko Peter mathews Roman Koeln Sazanami Solivagant Stanislaw Warwas Szucs Tamas Walter H.